If you do not want to use the parking area near the lake, please be aware that whilst we are still permitted to park in the Holiday Inn car park, you will incur a charge UNLESS you enter your vehicle registration number on the computer provided for this purpose at the Hotel Reception. This must be done each time you visit, and as soon as you have parked. It is also advisable to display a Club Badge in the vehicle. 1. No boats to be put on the water before 10 am. Please do not arrive at the lake before 09:45 am. 2 Before starting to sail familiarise yourself with the location of any fishermen, and ensure you give their equipment a wide berth. In particular if they are casting into the lake, avoid crossing the line of cast. 3. High Speed and Fast boats to be throttled back, and kept to areas of the lake away from fishermen. FAST ELECTRIC BOATS are not permitted. We are Group Members of the Paxton Lakes Sailing Club and as such are able to sail on the lake at any time. 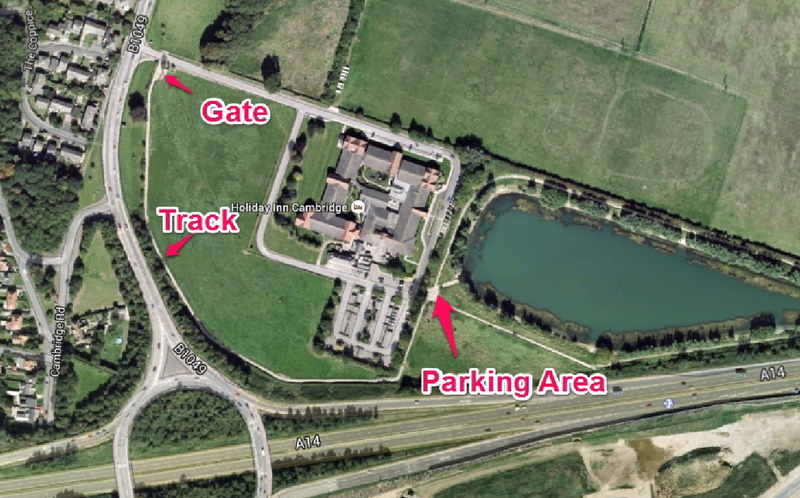 However, access to the lake is controlled by two locked gates, and we have only two keys! There is no restriction on the types of models sailed at Paxton, except no IC. There are some special rules which we apply to this lake so please be sure to check these on the Rules page of this site. 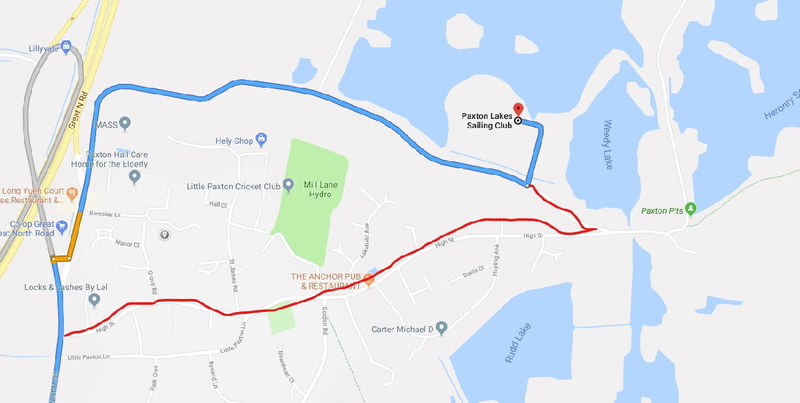 There is no postcode for the sailing club, but PE19 4ET, the postcode of the nearby Nature Reserve, will get you close, or see the map below. The easiest route is the one in blue – follow signs to “The North” and turn right at the next turning past the Nature Reserve sign. Follow the road round until you see the lake, the entrance is some 50 yards further on the left. The red route takes you through the village following signs for the Nature Reserve. Turn sharp left at the reserve Car Park up a road marked “Quarry & Works Only”, and with an Aqua Park sign. The entrance is about 50 yards on the right. There are no restrictions on fast electric boats at Paxton, but IC boats are not allowed. 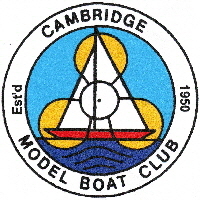 Although the sailing club have not imposed any restrictions on our use of their lake, we plan to use it primarily on the First Tuesday of each month, and on Thursdays. To use it at any other time you will need to arrange to collect a key, either from John Parsons or Paul Shea. If you would like to visit us at this site please contact a Committee Member to check what days we sail.